'Who could read the programme for the excursion without longing to make one of the party? 'So Mark Twain acclaims his voyage from New York City to Europe and the Holy Land in June 1867. His adventures produced The Innocents Abroad, a book so funny and provocative it made him an international star for the rest of his life. He was making his first responses to the Old World - to Paris, Milan, Florence, Venice, Pompeii, Constantinople, Sebastopol, Balaklava, Damascus, Jerusalem, Nazareth, and Bethlehem., For the first time he was seeing the great paintings and sculptures of the 'Old Masters'. He responded with wonder and amazement, but also with exasperation, irritation, disbelief. Above all he displayed the great energy of his humour, more explosive for us now than for his beguiled contemporaries. A classic work . . . [that] marks a critical point in the development of our literature. Leslie A. Fiedler"
Samuel Langhorne Clemens was an American humorist, satirist, lecturer and writer. 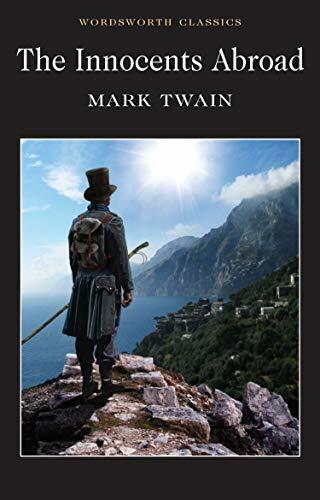 Born on 30 November 1835, Clemens (better known by his pen name Mark Twain) is most renowned for his novelsThe Adventures of Huckleberry Finn and The Adventures of Tom Sawyer. He was described as ‘the father of American literature’ by the American author William Faulkner.